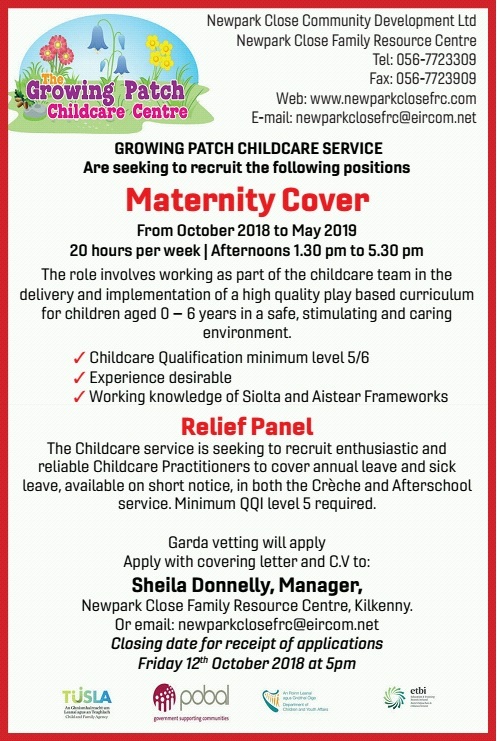 Growing Patch Childcare Service are seeking to recruit a person for maternity cover from October 2018 to May 2019. Twenty hours per week, afternoons 1.30pm to 5.30pm. The role involves working as part of the childcare team in the delivery and implementation of a high quality play based curriculum for children aged 0 – 6 years in a safe, stimulating and caring environment. The Childcare service is seeking to recruit enthusiastic and reliable Childcare Practitioners to cover annual leave and sick leave, available on short notice, in both the Crèche and Afterschool service. Minimum QQI level 5 required. Sheila Donnelly, Manager, Newpark Close Family Resource Centre, Kilkenny.